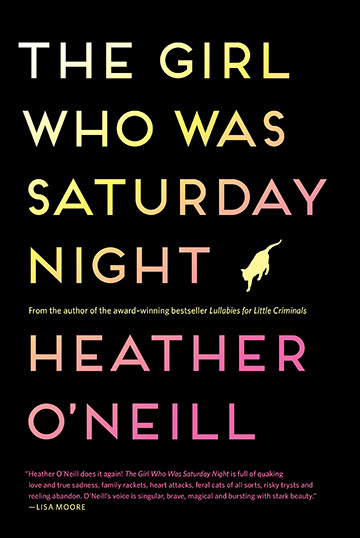 It took me a while to warm up to this book, primarily because Heather O'Neill uses way too many metaphors. Her metaphors line up at the edge of the cliff like lemmings and fling themselves into the story. The strong-box where her metaphors are stored has a broken lock and all the words have escaped and are multiplying wantonly. Her house is decorated with metaphor throw rugs that grow like jungle vines and choke out all the furniture. But then, a strange thing happened. 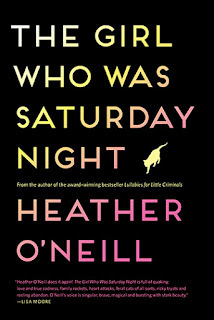 About halfway into The Girl Who Was Saturday Night all those metaphors, all that imaginative language, started to impart a feel of magic realism to the story. Not the over-the-top surrealistic magic realism of a Michel Gondry film, say, but a more subdued, more Canadian form of the narrative style. I let myself just relax and enjoy the fantastical ride. Set against the backdrop of the 1995 Quebec referendum (the one in which the non vote won with a mere 50.58% majority), The Girl Who Was Saturday Night is the tale of Nouschka Tremblay, nineteen-year-old former child-star who, along with her twin brother Nicholas, is trying to move beyond childhood fame. Abandoned as newborns by their 14-year-old mother, the twins were used as performance props by their wildly famous folk-singer father (now a desperately washed-up ex-con)and raised in a cat-filled apartment by their increasingly dotty grandfather. Nouschka is a character who grows on you. Smart, but a little flighty, charming and matter-of-fact about her casual sexuality, she is trying to forge her own path in the world, while maintaining the intensely close relationship she shares with Nicholas. Things don't always go well. But then they do. One incident in the novel made me gasp audibly. The Girl Who Was Saturday Night is a charming stranger who will pick your pocket while asking you for directions to the Metro. Images tumble from its pages like a basket of balloons kicked down the stairs by a petulant child. And there is always a stray cat climbing in through the open window to curl up on your bed. I've often found myself really turned off by an author's style, only to embrace it halfway through, so I can relate. It's partly why I don't believe in giving up too soon, like those people who say, "I gave up after a couple of pages. I just knew I wouldn't like it." Good on you. Did O'Neill have that issue with Lulluabies for Little Criminals too? I don't recall. I don't remember that being an issue with Lullabies for Little Criminals, John. I have to applaud O'Neill for branching out into a new writing style. So often we write only in our natural rhythm without trying out anything different. Sounds fun and grandly told, if by grand one means grand staircase, Grand Hotel, Grand Prairie. Your active examples have verily fortified my shambolic sense of cymbals crashing madly in the creaky-throated wind ~ three cheers, Barbara ~ a triumphant arc, indeed! You are pretty triumphant at the art of the metaphor yourself, Erik! Bravo!